Aitutaki is located 230km north of Rarotonga, an unspoiled landscape of lush vegetation, swaying palms, friendly faces, all ringed by one of the world’s most beautiful blue lagoons. A South Pacific vacation to Aitutaki is the stuff dreams are made of. Aitutaki lagoon is a postcard brought to life and a must for anyone planning Aitutaki travel! Prepare to slow down, relax and enjoy Aitutaki travel on “island time”. The locals are wonderfully welcoming, open and friendly people. You can make many new friends! This magnificent and remote island has a triangular-shaped ‘almost’-atoll rising up 4000 meters from the floor of the Pacific Ocean. It consists of three volcanic and 12 coral islets (motus). 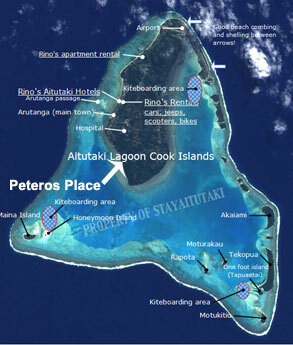 The main island is where most of the Aitutaki accommodation is located, the smaller islands mostly uninhabited. See this Google Map. – The currency used in the Cook Islands and Aitutaki is the New Zealand Dollar. – Religion – strongly Christian. How do I get to Aitutaki? They have five flights per day Monday-Saturday and two on Sunday, from Rarotonga to Aitutaki to Rarotonga. The trip over is only forty-five minutes and is worth it for the view of the lagoon alone. Be aware that we are 3 hours behind Los Angeles (Pacific time) and 22 hours behind New Zealand time. Don’t get caught out with your booking plans: i.e. NZ departures on a Saturday will get you to Rarotonga on a Friday! What kind of transportation is there on Aitutaki? There is no public transport system (buses) and only one taxi on Aitutaki. Your options are: rent a car/scooter/push-bike, or walk. A car is a good idea if you have small children or are not comfortable on a scooter. One of the biggest car and scooter rental companies on the island is Rino’s Rentals. Your Caretaker host Rakamo can help you arrange your transportation.